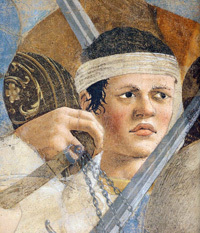 Piero interpreted the encounter as a complex battle spreading across the wall from left to right, full of blood and heavy weaponry. 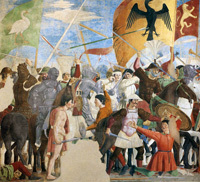 Painted in exquisite detail, the procession to victory can be read in the flags, moving from the imperial eagle to the standards of Islam, one, decorated with Moorish figures, in tatters, the other with crescent moons, falling to the ground. The warriors on both sides wear all sorts of armor, including colorful Roman molded leather cuirasses and Renaissance style harnesses of polished laminated steel, reflecting the real light that streams from the window on the altar wall. A war-weary bugler in a tall white hat sounds his horn, while all around him weapons fly through the air. 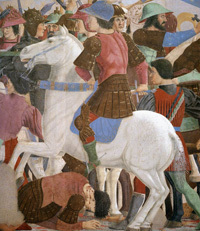 At the right-hand edge of the battle, a mounted knight receives a dagger-thrust to the throat, and as he falls back seems to regurgitate the cross from his very mouth. 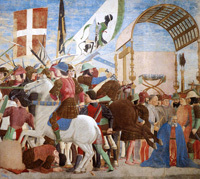 To the right of the frescoare the flags of the defeated enemy: a black one with yellow decorations, limply hanging down; another torn one with moor's heads, and a third one with a white ground and three six-pointed stars and the Turkish crescent moon.